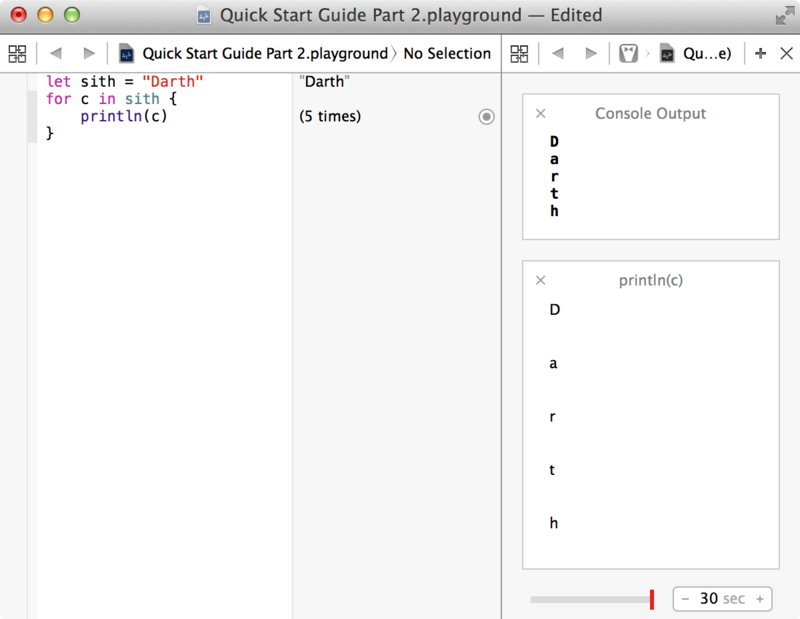 Quick Start Guide to Swift: Part 2 | Yeah, But Is It Swift? If you haven’t worked your way through the first tutorial in the series then I recommend you start from there. You should also consider installing Xcode 6 and creating a playground to try out his tutorial’s various code examples. Detail regarding that can be found in the first tutorial. We briefly looked at strings in the first tutorial. Let’s revisit them and get some more detail. let jedi = "Luke Skywalker"
let name = "Anakin Skywalker"
In order to see the results of a loop within your playground you’ll need to take advantage of the timeline assistant. To do this, look in the sidebar, directly along from your loop’s println() call. You should see the text (5 times) and an icon of a dot to the right of that. If you click that icon, the timeline assistant pane will open and you’ll be able to see the result from each iteration of your loop. In the code example above, the c variable will hold a single character at any one time and is therefore of type Character. let character1: Character = "c"
let character2: Character = "c"
Notice that the Character type had to be explicitly declared to prevent both variables from being inferred as String types. There is no single-quote syntax for character literals in Swift. let myCharacter: Character = "c"
var jedi = "Luke Skywalker"
The above example will output 14. Create two constants. Set the first to hold your forename and the second to hold your surname. Concatenate both constants and hold the result in a variable called fullname. Finally check the number of characters stored within your fullname variable. If it’s over 15 characters in length then print The name is too long. to the appropriate output. Otherwise, simply print your full name. let name = "Luke Skywalker"
let message = "\(name) scored a total of \(kills * pointsPerKill) points"
This will result in a message variable that contains the string value: Luke Skywalker scored a total of 640 points. This will result in the lastCharacter constant being assigned a value of e. It’s important to note that the index constant above is not of type Int. Instead it’s a String.Index opaque type, which Swift’s character and range indices are based on. Arrays are one of two collection types supported by Swift (Dictionaries being the other). Each element within a Swift array must be of the same type. In the example above, the array cannot be altered after it’s initialised. By assigning your array to a variable instead, you’ll be free to add, remove, or change values stored within it. This will replace the first three strings within the topFriends array with “Christopher”, “Alan”, and “Freddy”. The code example above will output [c3p0, r2d2, r5d5]. The example above will print [c3p0, r2d2, r5d5, ig88, tc14] to the appropriate output. This will insert a value of 150 immediately after 100 in the array. The final output will be: [10, 50, 100, 150, 500]. This will remove the second item from the array and print the following: [10, 100, 500]. Write a program that takes an array of integers and sorts them in ascending order. The sorted list should be printed to the appropriate output. For example, if you were to start off by initialising a variable that held the following values: 20, 40, 10, 5, 200, 145, 5. Then your program should display those values in the following order as its final result: 5, 5, 10, 20, 40, 145, 200. This will result in a runtime error since we’re trying to access the 65th string within an array that only contains four values. The example above avoids the risk of a runtime error. It’s also worth remembering that array indexes are zero-based in Swift. You should take that into account when using an array’s size to determine if an index position is within bounds. Unlike arrays, dictionaries do not store items in a specified order. Instead, each item added to a dictionary is associated with a unique key, which acts as an identifier for that item. All items added to a dictionary must be of the same type. The same is true for the unique keys you use also. We have a dictionary of player scores. Each player’s name is used as a key, and there is a score associated with each key. The keys are of type String and the values are all of type Int. In other words, we have declared a dictionary that has a type of [String: Int]. As you can see from the example above, the key Bob doesn’t actually exist within the dictionary. When this is the case, nil will be returned. If you think back to the first tutorial in the series, you’ll remember that variables and constants in Swift cannot be nil and must always have a value associated with them. To get around this constraint, Swift provides optionals, which can either have a value or no value at all (nil). Given the following array of names ["Maul", "Vader", "Emperor"], write a program that finds each character’s rating and prints it to the screen along with their name. The code snippet above adds a new key named Christopher and associates a value of 50000 with it. Note from the example above that the your array’s type needs to match the type of the values stored within your dictionary. It’s important to remember that items within a dictionary have no specific order. In other words, you can’t be guaranteed that keys, values, or key-value pairs will be retrieved in any specific order when attempting to iterate over a dictionary. Write a program that iterates over your dictionary and displays the names of those who have scored over 5000 points. Also display each person’s score alongside their name. Swift provides the familiar while and do-while loops. Let’s take a look at the while loop. The while loop starts by evaluating its condition. If the condition is true, the loop’s block of statements is repeated until the condition becomes false. In the case of our example, the loop continues until the index variable no longer has a value less than 5. The major difference between both variations is that the do-while loop will always execute the statements within its block at least once, whereas a while loop’s block may not execute at all if its condition initially evaluates to false. Don’t forget about block scope. Variables and constants declared within while and do-while loops are only valid within the scope of each loop. Running this within your playground will result in Dooku is a Sith being displayed in the sidebar. More or less as you’d expect, right? If you’re an Objective-C developer then you’ll be delighted to see from the above example that you can switch on strings. While developers of ECMAScript-based languages have always been able to do this, Objective-C’s roots meant that its switch statement had all the hangups of the C programming language. It should also be noted that switch statements in Swift should be exhaustive. What I mean by that is, there should be a matching case statement for every possible value. Where that isn’t feasible, the default keyword should be used to provide a catch-all. Before continuing, add the default case back into your code example. This code will fail to compile for two reasons. First, as discussed, Swift’s Switch statement does not fall through to the next case by default. Secondly, in Swift, the body of each case must contain at least one executable statement. As has just been discussed, switch statements in Swift do not automatically fall through the bottom of each case and into the next one. Therefore there’s no need to explicitly place a break statement at the end of each case since the execution of your switch statement will terminate as soon as the first matching case is completed. While the code snippet does technically work, it has been contrived in order to illustrate how the fallthrough statement works. If you find yourself writing code like this then you really should consider ditching the fallthrough statement and created comma separated lists of matches for each case instead. The example above would result in You have much to learn. being printed to the appropriate output. We only see the use of the closed range operator (a...b) here, but the half-open range operator (a..<b) can obviously be used too. This would print A Retina iPhone to the appropriate output. In the above code example, a player’s status is printed based on their current energy and the game level they have reached. The player’s health is regarding as being of greater importance, so a message related to their energy will take priority. This is handled by the first two case statements, with an underscore used to ignore the player’s current level. The next two are more concerned with the player’s level progress, with an underscore being employed to ignore the player’s energy value. Also notice the use of the closed range and half-open range operators throughout the switch statement’s cases. Running the above code within your playground would result in Awesome! Keep going! being displayed in the sidebar. This would result in You completed the game with a health of 15. being output to your playground’s sidebar. The above example would result in You are being swamped by the enemy and are close to death. being sent to the appropriate output. Notice that our code example introduces a constant named enemyCount, which appears in both usages of the where clause. The first where clause also uses a temporary energy constant that is bound to the first tuple value matched by its associated case. We have a 2D Cartesian coordinate system that has a square and a rectangle placed on it. The square’s top-left corner is at (-2, -2) and its bottom-right corner is at (2, 2). The rectangle’s top-left corner is at (-4, -10) and its bottom-right corner is at (4, 10). Write a program that takes an (x, y) point and provides feedback as to where that point is. If the point is at the origin then print Is at the origin to the appropriate output. If the point is within the square then print Within the square. If the point is within the rectangle then print Within the rectangle. If the point is lying somewhere along the x-axis then print On the x-axis. If the point is lying somewhere on the y-axis then print On the y-axis. For any other position, then display Somewhere else. Use a tuple to define the point and take advantage of Swift’s switch statement to determine the point’s position. Test you code with a few locations such as (0, 0), (1, 1), (3, 6), (0, 20), (20, 0), and (40, 70). I hope you can see from these examples just how powerful Swift’s switch statement can be. So what is an enumeration? Put simply, an enumeration is a type that represents a group of related values. For example, you may want to create a type that represents the days of the week, or a type that represents the months in a year. Another example could be a type that represents the four points of a compass. In the example above we have defined an enumeration type named Day that contains the days of the week (Monday, Tuesday, Wednesday, Thursday, Friday, Saturday, and Sunday) as its members. The case keyword was used to declare each member of the enumeration. It’s also possible to comma separate our members on a single line. The code snippet above will print Swimming lessons today to the appropriate output. Once again, notice the use of the shorthand syntax (.Wednesday rather than Day.Wednesay) within the if statement’s condition. Adding the following to your playground file would result in It's the weekend! being displayed within the sidebar. It’s also worth noting that the default statement wasn’t used in our switch statement. There was no need to because an exhaustive list of all possible enumeration values was provided. Rock-paper-scissors is a game where two players simultaneously form one of three shapes with their hand. The “rock” beats scissors, the “scissors” beat paper, and “paper” beats rock. If both players throw the same shape then the game is tied. Write a small program that plays out a single game of Rock-paper-scissors. Declare an enumeration named Shape that contains the game’s three shapes: rock, paper, and scissors. Declare two constants named player1 and player2 to hold each player’s chosen shape. Finally, use an if statement to handle the logic to determine which player has won. You’ll also need to handle a tie situation. If player one wins then Player 1 wins should be displayed. If player two wins then display Player 2 wins. In the event of a tie situation, The game is tied should be output. Test your code by setting different values for your player1 and player2 constants. In programming languages such as Objective-C, each of an enumeration’s members is assigned an integer value, typically starting from 0 and being incremented for each subsequent member. In Swift, each member is a value in its own right and does not require an integer to be assigned to it. However, you can assign an integer (or any other type) to each member if you so require. These values are known as raw values and must all be of the same type. This would result in Today's position within the week is: 3 being sent to the appropriate output. The initializer returns either an enumeration member or nil if a member doesn’t exist for the specified raw value. In other words, it returns an optional enumeration member. Since we are dealing with an optional in our example above, optional binding is used to ensure that we aren’t inadvertently working with a variable whose value is nil. The example above will result in Swimming lessons today being printed to the appropriate output. We’ve just seen how the members of an enumeration can be pre-populated with raw values. As an alternative you can also associate a value with an enumeration’s member. The distinction between the two is that a raw value is fixed to a specific member, whereas an associated value can vary every time you use that member. The line above states that construction is six months behind. Not only are we seeing the flexibility of enumerations within Swift, we’re also once again seeing just how powerful Swift’s switch statement is. In our code above, we can see the closed range operator being used to specify a case where construction is between 0 and 3 months behind, and another case where construction has been delayed between 4 and 6 months. I hope you can see the benefit of using Swift’s enumerations. While we’ve spent significant time with enumerations, there’s actually still a lot more to learn. For example, enumerations support many of the features that are traditionally only associated with classes including instance and static methods, but we’ll leave that for another day. Once again we’ve covered a significant amount of ground. There’s plenty to digest so please spend as much time as possible experimenting within a playground until you’re confident you fully understand everything. That goes for many of the language features (optionals, tuples, range operators, etc) from part one that were utilised in this second tutorial. In part three we’ll start by looking at functions before moving on to structures. Structures share many of the same features as classes, and are therefore a good place to start before exploring Swift’s object-oriented features. I’d like to reiterate the message from last time. There really isn’t anything particularly difficult about the basics of Swift. Coming from other languages, some of Swift’s concepts may seem unfamiliar, but spend some time working with them and you’ll quickly be able to master them. See you in part three.